Neutron reflectometry investigates the elemental/isotopic depth profile and the lateral structure of thin films and nanostructures. The GINA neutron reflectometer is a constant-energy angle-dispersive, vertical-sample instrument. Reflectivity ranges of five orders of magnitude have been measured in magnetic and non-magnetic sample environments. The setup is displayed in Figure 1 and the operation parameters are summarized in Table 1. The 5-element focusing graphite monochromator (MONO in Figure 1) provides neutrons with wavelengths within the range of 3.2-5.7 Å and ∆λ/λ~2%. Without further restructuring, the present stable operation is ensured at a wavelength of 4.67 Å. Unpolarized and polarized beam options are available and can be combined with different sample environment options. The unpolarized beam is provided using a cryo-cooled Be-filter (BF). Higher harmonics intensity is efficiently filtered by a Be block. The transmission of the Be filter is 41% and 87% for λ=4.67 Å, without and with liquid nitrogen cooling, respectively. The polarized neutron beam is produced by using a magnetized supermirror (P1) and an adiabatic radio-frequency (RF) spin flipper (SF1). The beam scattered by the sample may undergo spin analysis by an identical setup of a spin flipper and a single magnetic supermirror spin analyzer (P2, polarized specular beam option), and finally it is detected by a two-dimensional position sensitive detector (DET). The incident intensity is monitored by a beam intensity monitor (IM, efficiency ~0.1% at λ= 4.67 Å). Figure 1. The layout of the GINA neutron reflectometer. The central sample tower ST supports the various sample environment components (permanent-magnet sample stage for large samples, electromagnet, cryostat, water cooled Helmholtz coils, thermostated solid/liquid cell, etc.). The incident angle on the sample surface is set by the Θ-goniometer of the ST. The detector arm of the reflectometer-supports the slits S3, and S4 with optional flight tube (unpolarized beam option) or S3, spin flipper SF2, the spin analyzer P2 (polarized beam option) and DET (both options) along with its electronics and dedicated control PC, which is mounted underneath the detector arm. The flight tube may be used to minimize the neutron scattering by air. The detector arm is moved by a wheel running on the marble surface while the corresponding air pads are activated to levitate the arm. Fine definition of the beam is maintained by the four slits. The blades are operated with a precision of 0.05 mm. With its optical elements the setup exhibits a relative Q-resolution of 10% to 2% for the available Q-range of 0.005 to ~0.25 Å-1. The MONO comprises five highly oriented pyrolytic graphite crystals on small motorized 2-circle cradles for horizontal alignment and vertical focusing. The latter doubles the intensity reflected by a 20x20 mm2 sample at 0.7º incident angle as compared to the non-focused case. Polarized neutrons are produced either by a single Fe-Co/Si magnetic SM in transmission (P1 in Figure 1) or by a locally invented 4-bounce SM polarizer in reflection geometry (Rev. Sci. Instrum. 89, 056105 (2018)). Spin analysis of the specularly reflected beam is performed by devices (P2) of identical construction. The spin flippers are of adiabatic RF type [S. V. Grigoriev, A. I. Okorokov, and V. V. Runov, Nucl. Instrum. Methods Phys. Res. A 384, 451 (1997)]. The flipper coil is placed in a longitudinal gradient field of 20-40 mT/m, with a center field of 5.6 mT. The flipper coil is part of a resonant circuit, with typical values of effective RF current and bandwidth of 4 A and 4.5 kHz at the resonance frequency of 166 kHz. The neutron detetector DET is a delay line type multi-wire proportional chamber (with active area of 200x200 mm2 and spatial resolution of 1.8 mm (FWHM)) encased in boron-containing shielding for background suppression. The detector is filled with a gas mixture of 3He and CF4. A DASY TDC module (made by ESRF, Grenoble) is installed in a slot of the PC dedicated exclusively to the detector data-acquisition. Table 1. The operation parameters of GINA. GINA is dedicated to magnetic heterostructures, for studies requiring different environmental parameters, such as low temperature and occasionally high external magnetic fields. For room-temperature reflectivity measurements, the sample is held in position by vacuum. Low temperature measurements can be performed in a closed-cycle cryostat (20 to 300 K range) which can be mounted on the sample tower ST with (cf. Figure 2) or without the electromagnet and with the sample space evacuated. An air-cooled electromagnet generates magnetic fields up to 0.55 T with pole distance of 40 mm which can accommodate the 1.5” diameter cryostat housing. The optional water-cooled Helmholtz pair provides fields up to approx. 35 mT. A vertical-sample liquid cell with temperature controlled (± 0.1K) liquid space is available to investigate Si-adhered soft matter films and membranes. Using remote desktop option, most operations can be performed remotely. The GINA hardware and control software are designed for maximum flexibility. In its full configuration, GINA comprises more than 30 remotely controlled stepping motors. Θ- and 2Θ-angles and precision slit positions are encoder-controlled. Hardware control is established via a USB multi-function data acquisition module to monitor/control the air compressor, the air pads, the temperature of the Be-filter, the beam shutter, the beam intensity monitor and various modular DC power supplies. The high voltage power supplies, the amplifiers, the discriminators and the ratemeters are of NIM standard. The control and detector PCs communicate via ethernet and with the stepping motor indexers as well as with the temperature controller via RS232 under the supervision of GINASoft written in LabView 2010. The program’s user interface is highly configurable and performs experiments including alignments, polarization and the sample environment control (flipper current and frequency, temperature, magnet current, etc.). Detector pictures and reflectivity data are efficiently viewed and manipulated during data acquisition. Data and log information are saved in clearly structured database format. Human control is facilitated by a web camera. Using remote desktop option, most operations can be performed remotely via internet from a distant location any time. closed-cycle cryostat. The magnet weight is partially relieved by the frame FR. Evaluation of specular reflectivity data is performed via modeling the depth profile of the layer structure (layer thicknesses, scattering length density, interface roughness for all) and can be evaluated in terms of the Parratt [L. G. Parratt, Phys. Rev. 95, 359 (1954) – non-polarized beam] or the supermatrix [e.g. A: Rühm et. al, Phys. Rev. B 60, 16073 – polarized and non-polarized beam] algorithms. The standard procedure to extract the lateral structure of scatterers is the Distorted Wave Born Approximation (DWBA). Both types of experiments can be evaluated by the locally developed fitting environment code, FitSuite. FitSuite is more than of reflectometry evaluation program. Presently FitSuite is capable of evaluating 14 different types of experiments (including specular neutron and x-ray reflectometry, off-specular neutron and x-ray reflectometry (by DWBA), transmission, emission, conversion-electron and synchrotron Mössbauer spectroscopy, etc.) with extended on-line help and video demostrations. Experimental data obtained by different methods and/or by the same method at different experimental conditions (temperature, magnetic field, etc.) on the same sample are commonly evaluated by independent data fitting programs. However, FitSuite, rather than evaluating only some of the parameters from one type of experiment and keeping them fixed when evaluating others, performs simultaneous evaluation of the experiemental data with their own statistical errors to correctly relate the mean values, deviations and fit parameter correlations: The program allows for extension/modification of the theories to account for a number of different/different types of experimental data. The versatility of FitSuite is ensured by handling fit constraints in terms of general and editable parameter transformation matrices. These matrices link the parameters, even of different theories and thereby define and directly fit the actual real physical parameters in the fit procedure. FitSuite is based on a user interface written in C++, which may be further developed . Interface is provided to include new methods. The software is freely downloadable from http://www.fs.kfki.hu. GINA is operated by the Functional Nanotructures research group of the Wigner Research Centre for Physics. 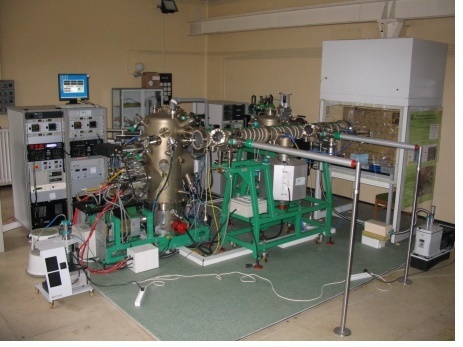 The majority of the thin film and multilayer samples investigated on the GINA neutron reflectometer are prepared in the ultra-high vacuum (UHV) Thin Film Technology Laboratory of the research group (Figure 3, http://mffo.rmki.kfki.hu/molecular). Serving own and external user projects the molecular beam epitaxy facility comprizes 13 atom sources in two e-guns and five effusion (Knudsen) cells for single and co-evaporation and even complex multilayer sequences can be deposited without the need of venting the UHV chamber. The system handles substrate sizes of up to 2”. The layer thickness is monitored by quartz thickness monitors, the surface structure can be sampled by Reflection High Energy Electron Diffraction. Residual gas analysis is performed by quadrupole mass spectrometry. The laboratory is capable of growing a very wide selection of (multi)layer systems from below monoatomic layers to layers up to ~100 nm thickness of almost any metallic and some compound targets (e.g. MgO). Moreover, a controlled gas source is available for gently flushing the chamber with gases of 10-6 to 10-11 mbar pressures controlled within a few per cent. For their significance in contrast enhancement in neutron and nuclear resonance/Mössbauer scattering studies and neutron scattering, two sources, 57Fe and 62Ni are installed in the deposition chamber for isotope-selective multilayer growth. Figure 3. The Thin Film Technology (MBE) Laboratory of the Wigner Research Centre. The laboratory offers GINA users its sample preparation services.